We offer among the highest rates for platinum coins not only in Georgia, but also nationwide. Platinum is one of the rarest precious metals in existence, making platinum coins both rare and valuable. We would love the opportunity to purchase yours. 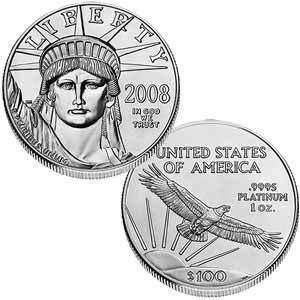 The American platinum eagle is the official platinum bullion of the United States of America. With a purity of 99.95% platinum, the coins are offered in 1 oz, 1/2 oz, 1/4 oz, and 1/10 oz denominations.American platinum eagles were first minted in 1997 and are offered in proof and uncirculated versions for coin collectors. The Australian platinum koala is the official platinum bullion coin of the Australian government. This coin displays an image of a koala bear on the reverse design of the coin. The obverse or front of the coin features Queen Elizabeth II.Platinum Koala coins are composed of 99.95% fine platinum and are available in 1Kg, 10 oz, 2 oz, 1 oz, 1/2 oz, 1/4 oz, 1/10 oz, and 1/20 oz versions. Issued by the Royal Canadian Mint, the platinum maple leaf coin is the official bullion coin of Canada. The coins are composed of 99.95% pure platinum and are available in 1 oz, 1/2 oz, 1/4 oz, 1/10 oz, 1/15 oz, and 1/20 oz sizes.Canadian platinum maple leaf coins were minted between 1988 and 2002, and the 1 oz version was re-introduced in 2009. As is the case with other official bullion coins, these coins are legal tender and have a stated face value but are traded based on the market value of platinum. Chinese panda coins are named for the giant pandas that are on the reverse of every coin in the series. 8,300 1 troy oz (total of 8,300 troy oz) platinum panda coins were first minted from 1987 to 1990.An additional 5,450 troy ounces of platinum was used to mint panda platinum coins of various sizes and weights from 1990 until 2005. Ready to sell your platinum coins? Contact us today for your free, no-obligation appointment. Or dial 615.535.2785 for instant service.